Four seasons in one day is how Tim described Burnham but I am pretty sure the overiding theme was “baltic” and certainly not summertime! Jonelle and Grovine de Reve actually did their phases in a snowstorm! The team headed up on Friday which made it a long old weekend with 8 horses spread out over three days. Last weekend the team did 16 in two days! It is a horrible long drive, its a venue that is always at the thick end of the wind coming off the Norfolk coast with nothing between it and Scandinavia but it is a tick the box event every spring for the CCI 4* S and the advanced tracks as well as the OI’s. Grappa Nera ( Grape) was not over impressed with her 8am dressage and her score pretty much reflected that! But there are more moments of harmony than discord and like most girls I think she will be much happier in the summertime! Her jumping phases are quite outstanding as she is such an athlete and she and Jonelle both enjoyed the showjumping and super cross country round in her intermediate. Classic Moet ( Molly) was in ‘go fast’ mode for her advanced dressage test with Jonelle describing her as the “Molly of old” but a 32 in that company was not so far off the pace and after a really well deserved clear round showjumping which Jonelle was delighted with they were best mates again! A spin around the advanced track with just 8 time added saw them into the top 10 and a great final run before Badminton. Jonelle had her first run on Terry Millers and Jo Preston-Hunt’s Grovine de Reve ( Reve) on Saturday in the OI. Reve was produced originally by Rodney Powell and then Dan Jocelyn and has plenty of experience and as we know, Jonelle is one of the best in the business, so it was not a surprise to see them gel together so quickly. 70% on the flat and a super double clear left Jonelle “really pleased” with Reve and they looked to be on track to make a great partnership. They even had to battle it out with the weather Gods who decided to send in a snowstorm just to make things a bit more complicated! Tim and Clara M had had a very good session with Isobel Wessels in the week and that certainly paid off with a 25 dressage which was only bettered in her section by Cooley Masterclass. She then jumped a super clear showjumping and Tim said he felt their cross country round saw them both on the same page and felt like the start of a great partnership. They made the top 10 in their section with the addition of just 8 time to their dressage score. Ascona M ( Ava) is a girl with unlimited talent, masses of scope, power and movement and always likes to talk back to her rider! Tim felt she was a “ticking timebomb” in the dressage warm up but she waited until she got into the arena where she aired her opinions in her usual wild fashion. Tim thought he would be on a 45 but even though she had her “moments” the good bits are so good that she still ended up on a 37. To be fair she has only had 1 OI run before this advanced test which wasn’t the original plan for sure! Ava then jumped a flamboyant clear round in the jumping ring before setting out on the cross country fresher than Tim has ever had her. Tim described her as a double handful all the way round but as they were approaching a big spread towards the end of the course he was suddenly aware of the fact that Ava was eying up the big stand off stride. Despite his best efforts to organise her into adding another one Ava was still set on the ‘Murphy Himself’ attack and wasn’t having a bar of Tim’s stride. Tim said he considered Ava’s distance for a split second before experience told him that this really wasn’t going to end that well and he manage to haul her off the fence just before they were totally committed. A small circle incurred 20 penalties before they quietly popped the fence and was far preferable to the inevitable faceplant into the Burnham sandy soil. I can only imagine the fence judges heartrate watching the original approach! 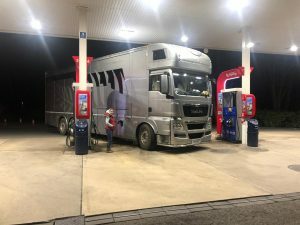 Excitement over for the day and Jonelle decamped for home in what Tim calls ‘the big fancy truck” with 6 horses, one pregnant groom ( that would be Lucy! ), 2 dogs, one nanny ( that would be Harriet!) and a small child. (That would be Otis). According to Tim that left him and Megan shivering over a single candle in the sparse surroundings of the second truck which had the misfortune to have a heater issue. The issue being that the heating had packed up working altogether! They managed to survive the night mostly thanks to drinking beer and eating pasta in Rusty’s truck with Carlos Paro but it appeared to be a close run thing. Annoyingly they also had to hang around until lunchtime to start the CCI 4*S showjumping. Bango ( Uno) had posted a solid 30.6 test and Xavier Faer ( Hugo) a supersoft swinging test for a 28.9. They both showjumped clear which was a great way to head into their respective 5 stars and Tim said that Hugo in particular had massively benefited from the Sunshine Tour jumping and feels like he is actually enjoying his showjumping now. Hugo finished on that note as he heads off on his journey to Kentucky on Tuesday and he has three runs already under his belt. Uno cantered round the 4 star track with consummate ease and Tim said it felt allot smoother than Weston and set him up perfectly for Badminton. 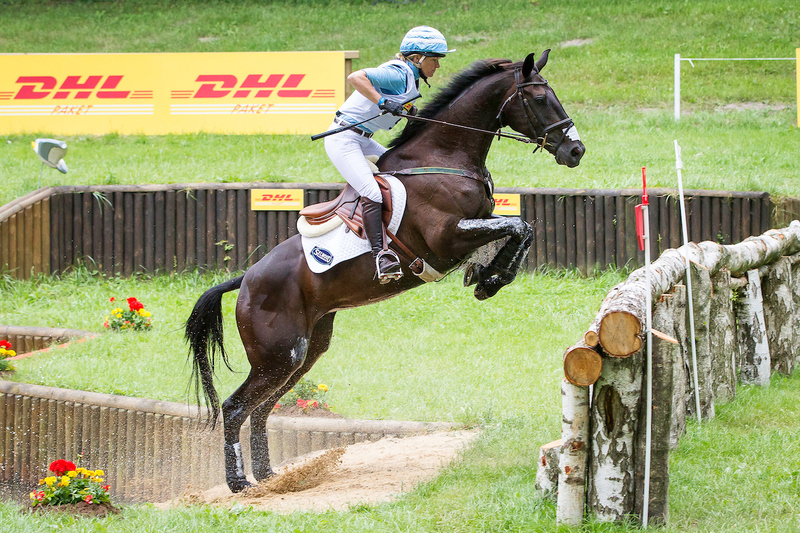 He describes Uno as being the ultimate all round event horse… he isn’t outstanding in any phase but he is becoming more and more polished in all three phases. So that just meant a long drive home for Megan and Tim who were simply delighted that the cab heater worked!